A few years ago, Ellen DeGeneres hosted the Oscars and, during the ceremony, took what might be the most famous selfie ever. Ok, so technically Bradley Cooper took it, and it might not be the most famous selfie ever, but it’s definitely got the most famous people (IRL, not photoshopped) in it than you can fit inside Instagram’s small frame. And though these days it might look a bit different, the guy between Brad and Julia, for example, probably wouldn’t be there – meaning poor Liza Minnelli may have got a look in – there’s no doubt Ellen could pull off another ridiculous picture such as this in a heartbeat. Because Ellen, being the affable talk show host she is, has the power to bring people together. Just look at Lupita Nyong’o’s brother, Peter, in the selfie – he’s the guy behind Bradley Cooper blocking out Angelina Jolie. Peter was at the ceremony to support his sister, who’d brought him as her guest for the evening. While some of us might be nervous to so casually join a bunch of the most famous people in the world for a selfie, he jumped in the picture because Ellen somehow does that to people – encourages them to come together, regardless of status. 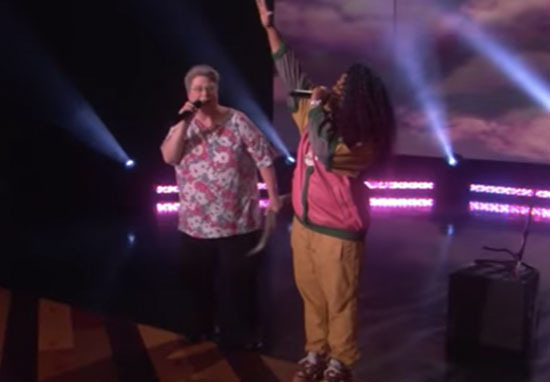 Well, enter Mary Halsey, a.k.a Mrs Funky White Sister, who wowed Ellen and her audience with an amazing karaoke version of Missy Elliott’s extra large tune, Work It. A couple of months ago, Mary posted a video of herself performing the song at a karaoke event in Goddard Park, Rhode Island. Armed with nothing more than a microphone and what appears to be an antler or something, she absolutely nailed it. The clip, naturally, went viral, and has so far clocked up a mega 13 million views, at the time of writing. Even Missy Elliott herself acknowledged Mary’s homage. So where does Ellen come in to all of this? Like I said, she brings people together. She makes things happen. Ellen got Mary on her show, chatting about her newfound internet fame and Missy Elliott-mimicking ability, encouraging her to recreate the magic. So Mary took to the stage to perform Work It once again. Mary, just like last time, is smashing it on stage, when who should walk over? Only Missy Elliott herself! Embracing Mary and joining in with the song, Missy Elliott brought the house down. Of course, artists surprising people while singing their songs is nothing new, but this time it just feels so genuine it’s hard not to let a massive grin appear on your face watching Mary and Missy collaborate. Ellen, you’ve done it again.